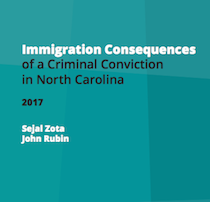 Using a step-by-step approach to the immigration consequences of a criminal conviction, the 2017 edition of Immigration Consequences of a Criminal Conviction in North Carolina explains the different types of immigration status and the various criminal convictions that trigger removal (deportation) in light of a person’s immigration status. Included is a detailed chart of immigration consequences of various North Carolina offenses. This is the second edition of the manual. It is available for purchase as a soft-bound book here. Sejal Zota is the legal director of the National Immigration Project of the National Lawyers Guild. There, she engages in nationwide litigation, provides training and technical assistance on a broad range of immigration issues, and authors practice advisories and reference materials. She is based in Durham, North Carolina. Previously, she was a public defender with the Bronx Defenders, a teaching fellow at the Immigrant Rights Clinic of the New York University (NYU) School of Law, and an immigration law specialist at the School of Government. She was the lead author on the first edition of this manual. She earned a B.A. in economics and public policy studies from Duke University and a J.D. from NYU.